They go by a variety of names; in common English parlance, they are alleyways, passages, lanes or paths; in regional variations, they are, to name but a few, jitties (West Midlands), jiggers (Liverpool), pends (Dundee), ten-foots (Hull), and closes (Edinburgh). In Manchester, they are most often called ginnels or genells or, more rarely, snickets. All of these words describe either a narrow passage between houses or a longer and wider walkway situated at the backs of terraces and between two streets. In the early decades of the nineteenth century, when back-to-back terraces predominated in industrial towns, these passages were generally known as courts: narrow paved yards between terraces and other houses that were cut off from street traffic and often accessible only via dark covered passageways. Widely condemned as insanitary breeding grounds of disease, back-to-backs and their courts were mostly replaced in the second half of the nineteenth century by more ordered rows of terraces that still characterise most British towns and cities today, and particularly industrial ones like Manchester. These cobbled passages and alleyways were included to provide easy access to the backs of terraces for the delivery of basic goods such as coal and the easy removal of rainwater and household wastes. They predominated in working-class areas of industrial cities where building speculators maximised the available space for housing whilst also abiding by the sanitary regulations laid down by the municipal authorities. In the 1960s it seemed, for a time, that the Manchester alleyway would become a thing of the past. In this decade, Victorian terraces were generally viewed by the municipal authorities as outdated and troublesome remnants of the nineteenth-century city that impeded the application of modernist principles of urban planning. In each year from 1963 to 1967, 4,000 Victorian terraced houses in Manchester were demolished by the Council with little attempt – at least in this period – to replace them. As testified by architectural critic Ian Nairn’s BBC programme Nairn Across Britain, by the early 1970s whole swathes of the terraced city were transformed into vast fields of rubble, their connecting alleyways remaining only as spectral outlines on the ground. The eventual rebuilding of these areas would see the disappearance of alleyways, the backs of the new houses opened up to adjoining car-parking spaces, public lawns and orderly cul-de-sacs. Two images from the Town Hall Photographer’s Collection (https://www.flickr.com/photos/manchesterarchiveplus/sets/72157684413651581), showing: above, a collapsed wall in an alley in Sapphire St that killed the householder, 1964; and, below, an alleyway off Stanley Street, 1962.. Both images copyright Manchester City CounciL. In the early-mid 1960s, when the decrepit Victorian terraces of Hulme were scheduled for demolition (to eventually make way for the brutalist high-rise concrete housing of the Hulme Crescents), the Council’s official photographer obsessively documented the back alleys of this area. In these images, the narrow cobbled lanes are found to be places of unhealthy congestion – dark, waterlogged and, in the case of one set of images picturing a fallen wall that killed an unfortunate resident, a literal danger to life. As with much official photographic documentation of slum housing in this period, the case for demolition is made by casting a negative light on the existing built environment. In these photographs of Hulme, alleyways recur because they are viewed as both redundant, unhealthy, and ungovernable – spaces that are clearly unfit for inhabitation (and there are never any people in these images). And yet, at exactly the same time as these official images of Hulme were being gathered, the amateur photographer Shirley Baker was capturing another aspect of the alleyway, namely as a place of human connection. In some of her poignant images of the backyards and alleyways of Hulme, both children and adults alike gather, caught in a moment of shared living in spaces that reveal private but shared examples of momentary freedom. 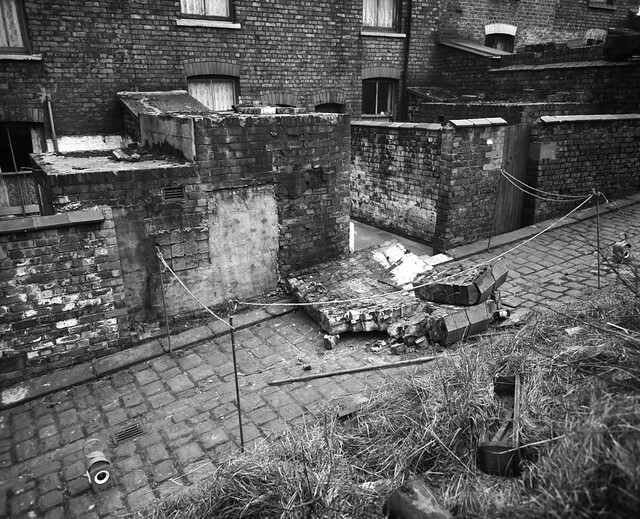 The alleyways of Hulme in Baker’s images are as rubbish-strewn, waterlogged and structurally unsound as they are in the official photographs; yet, their human occupants speak of them as places of value, where demolition will not only result in the erasure of spaces but also of valued memories as well. Despite the loss of Hulme’s and other areas’ alleyways in Manchester, some still survive today, mostly in small pockets of densely-built Victorian terraces in areas like Moss Side and Whalley Range, where their names – ‘Passage No. 1’, ‘Passage No. 2’, and so on – ring out like a common refrain that links together otherwise scattered districts of the city. They may be taken-for-granted, grounded as they are in everyday life; but alleyways have always been ambivalent spaces. They are neither public nor private; rather a mix of the two – liminal places that are both valued and feared. 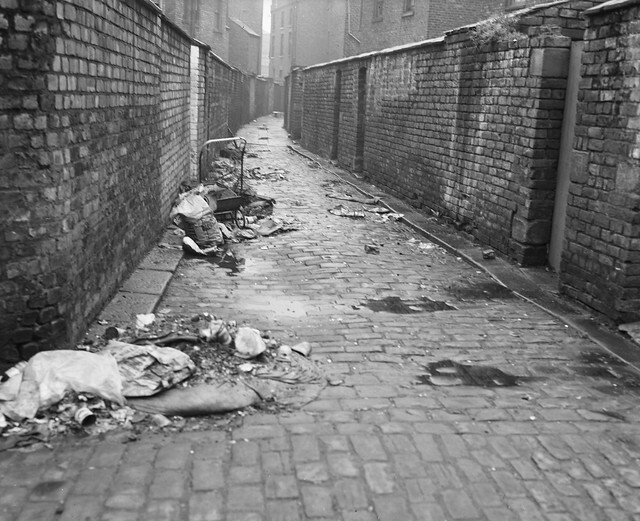 As Baker’s photographs show so clearly, householders connected with each other in alleyways, whether in chance meetings or in shared activities like putting the rubbish out. Yet, the wider public are often seen as a threat, taking advantage of the public yet hidden nature of alleyways to engage in all manner of nefarious activities: drug dealing, sexual assault, burglary (the most common stories you’ll find if you search for ‘Manchester alleyways’ online). This ambivalence has resulted in two opposing approaches to alleyways in the contemporary city. On the one hand, the widespread gating of back passages in areas like Oldham has effectively severed the alleyway’s link to the outside world, turning the public into the private; on the other, the ‘greening’ of alleyways, such as a few in Moss Side in the late 1990s, has reclaimed them as valuable communal spaces, where potted plants jostle with wheelie bins and discarded objects for ascendancy. Even when renovated, it seems, the disorderly nature of the alleyway can’t be fully tamed. The fundamental ambivalence towards these spaces derives from the fact that they are spatially unstable and dependent on the existence of other places and boundaries to define them. In this sense, alleyways are not only physical boundaries in the city but also metaphorical ones too – boundaries between the present and past, where a host of secret stories, both good and bad, linger on in these cracks in the city. Found this really interesting, especially in respect of space management! Thanks – glad it was useful to you!